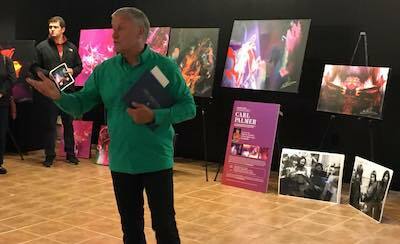 [NEW YORK, NY – September 27, 2018] – Carl Palmer, one of rock's iconic figures and a founding member of both Emerson Lake & Palmer and ASIA, will host an exclusive charity art gallery on October 21 at 5pm prior to his show at The Iridium in New York City that night. 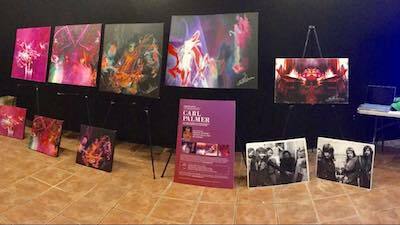 The gallery will showcase a series of rhythm-on-canvas prints featuring stunning visual images created completely by Palmer's drumming. A video describing the making of this unique artwork can be seen below. Additionally, Palmer will have available for purchase The Orchadia Scarf, a one-of-a-kind silk scarf made from one of his designs. This exclusive art event is only open to ticketholders for the opening night of Palmer's multi-night run at The Iridium October 21-23, and a portion of the proceeds from the artwork sold will go to VH1 Save The Music. "I am very excited to discuss and exhibit my unique portfolio of artwork to my fans who attend this event at The Iridium in New York City," said Carl Palmer. "To be able to create such images through modern technology while playing my drums is something I could have only have dreamed about in the past. Today, that reality is here." For information on Carl Palmer's art please visit www.carlpalmerart.com, and for all things Carl Palmer, please visit: www.carlpalmer.com.